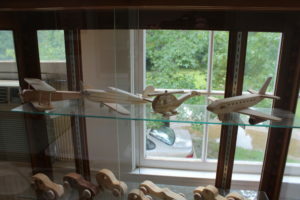 Over the Hill Gang: Who we are, what we do – Alabama Woodworkers Guild, Inc.
First to clarify. The Over the Hill Gang refers to a location not a particular age! 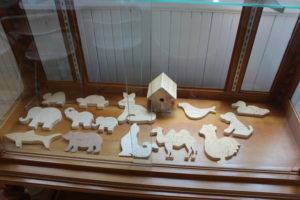 Now that is out of the way, every Tuesday a talented group of Guild Members gather at the Woodworkers Education Center (WEC) in Maylene, Alabama for fellowship, coffee, and more to the point craft fine wooden toys. 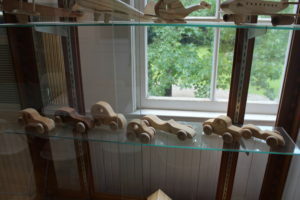 Donated wood is milled and sized for particular projects and everyone pitches in with drawing out, sawing, sanding, drilling, sanding, router edges, sanding, gluing and sanding a multitude of toy projects. These toys are then delivered to Children’s Hospitals and Community Ministries in Birmingham, Atlanta and Nashville. The OTHG is open to any Guild Member and gathers at the WEC every Tuesday from 9am to 2:30pm so come on out and join us. Don’t forget to pack a lunch, we like to sit around the kitchen table family style and “chew the fat” so to speak.